Intels i9 announcement this year felt like it pretty much came out of nowhere, and whilst everyone was expecting Intel to refresh its enthusiast range, I suspect few people anticipated quite the spread of chips that have been announced over the recent months. So here we are looking at the first entry to Intel’s new high-end range. I’ve split this first look into 2 parts, with this section devoted to the i9 7900X and some discussion of the lower end models as the full range is explained. I’ll follow up in the near future with a forthcoming post to cover the i7’s coming in below this model, just as soon as we have the chance to grab some chips and run those through the test bench too. There has been a sizable amount of press about this chip already as it was the first one to make it out into the wild along with the 4 core Kabylake X chips that have also appeared on this refresh, although those are likely to be of far less interest to those of us looking to build new studio solutions. A tale of two microarchitectures. Kabylake X and Skylake X have both launched at the same time and certainly raised eyebrows in confusion from a number of quarters. Intels own tick/tock cycle of advancement and process refinement has gone askew in recent years, where the “high-end desktop” ( HEDT chips) models just as the midrange CPU’s at the start of this year have gained a third generation at the same 14nm manufacturing process level in the shape of Kabylake. 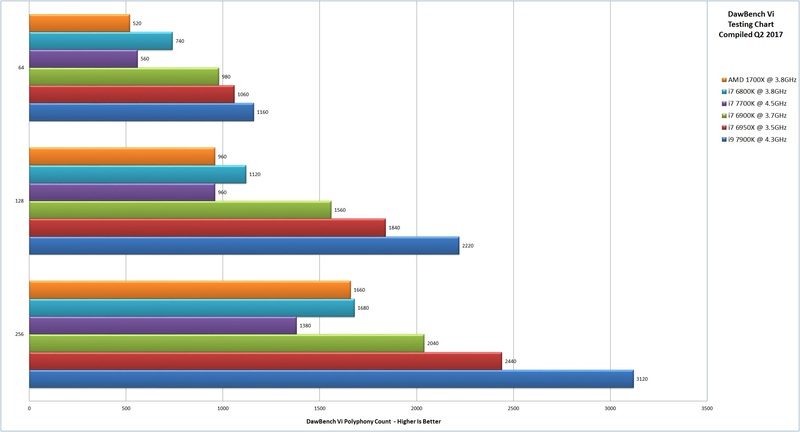 Kabylake with the mid-range release kept the same 14nm design as the Skylake series before it and eaked out some more minor gains through platform refinement. In fact, some of the biggest changes to be found were in the improved onboard GPU found inside of it rather than the raw CPU performance itself, which as always is one of the key things missing in the HEDT edition. All this means that whilst we have a release where it’s technically two different chip ranges, the isn’t a whole lot left to differentiate between them. IN fact given how the new chip ranges continue to steam ahead in the mid-range, this looks like an attempt to help bring the high-end options back up to parity with the current mid-range again quickly which I think will ultimately help make things less confusing in future versions, even if right now it has managed to confuse things within the range quite a bit. Kabylake X itself has taken a sizable amount of flak prior to launch and certainly appears to raise a lot of questions on an initial glance. The whole selling point of the HEDT chip up until this point has been largely more cores and more raw performance, so an announcement of what is essentially a mid-range i5/i7 grade 4 core CPU solution appearing on this chipset was somewhat of a surprise to a lot of people. As with the other models on this chipset range, the 4 cores are being marketed as enthusiast solutions, although in this instance we see them looking to capture a gaming enthusiast segment. The have been some early reports of high overclocks being seen, but so far these look to be largely cherry-picked as the gains seen in early competition benchmarking have been hard to achieve with the early retail models currently appearing. Whilst ultimately not really of much interest in the audio & video worlds where the software can leverage far more cores than the average game, potentially the is a solid opportunity here for that gaming market that they appear to be going after if they can refine these chips for overclocking over the coming months. However early specification and production choices have been head-scratchingly odd so far, although we’ll come back to this a bit later. So at the other end of the spectrum from those Kabylake X chips is the new current flagship for the time being in the shape of the Skylake 7900X. 10 physical cores with hyper-threading give us a total of 20 logical cores to play with here. 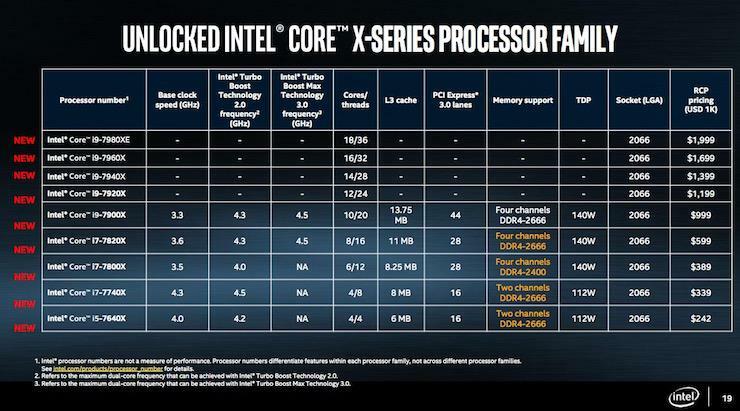 This is the first chip announced from the i9 range and larger 12,14,16,18 core editions are all penciled in over the coming year or so, however, details are scarce on them at this time. At first glance, it’s a little confusing as to why they would even make this chip the first of its class when the rest of the range isn’t fully unveiled at this point. Looking through the rest of range specifications alongside it, then it becomes clear that they look to be reserving the i9’s for CPU’s that can handle a full 44+ PCIe lane configuration. These lanes are used for offering bandwidth to the connected cards and high-speed storage devices and needless to say this has proven a fairly controversial move as well. The 7900X offers up the full complement of those 44 lanes although the 7820X and 7800X chips that we’ll be looking at in forthcoming coverage both arrive with 28 lanes in place. For most audio users this is unlikely to make any real difference, with the key usage for all those lanes often being for GPU usage where X16 cards are the standard and anyone wanting to fit more than one is going to appreciate more lanes for the bandwidth. 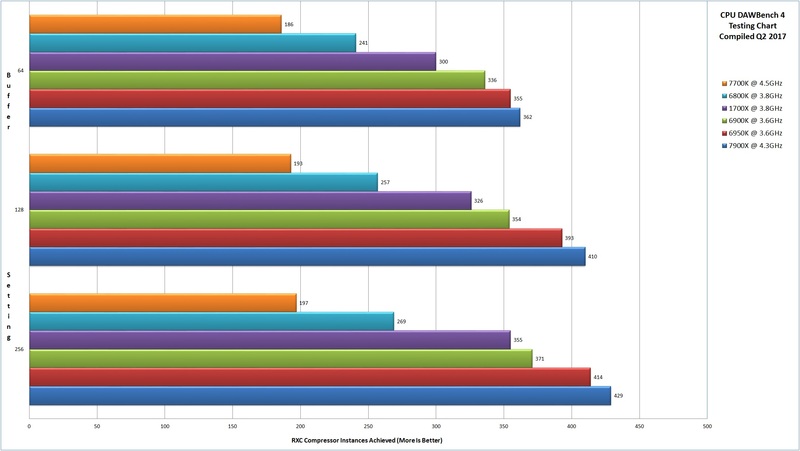 With the previous generation we even tended to advise going with the entry level 6800K for audio over the 6850K above it, which cost 50% more but offered very little of benefit in the performance stakes but did ramp up the number of available PCIe lanes, choosing instead to reserve this for anyone running multiple GPU’s in the system like users with heavy video editing requirements. Much like AMD and their infinity fabric design which was implemented to improve cross-core communication within the chip itself, Intel’s arrived with its own “Mesh” technology. Functioning much like AMD’s design, it removes the ring based communication path between cores and RAM and implements a multi-point mesh design, brought in to enable shorter paths between them. In my previous Ryzen coverage I noted some poor performance scaling at lower buffer settings which seemed to smooth itself out once you went over a 192 buffer setting. In the run-up to this, I’ve retested a number of CPU’s and boards on the AMD side and it does appear that even after a number of tweaks and improvements at the BIOS level the scaling is still the same. On the plus side, as it’s proven to be a known constant and always manifests, in the same manner, I feel a lot more comfortable working with them now we are fully aware of this. In Intels case I had some apprehension going in that given it is the companies first attempt at this in a consumer grade solution and that perhaps we’d be seeing the same sort of performance limitations that we saw on the AMD’s, but so far at least with the 7900X the internal chip latency has been superb. Even running at a 64 buffer we’ve been seeing 100% CPU load prior to the audio breaking up in playback, making this one of the most efficient chips I think I’ve possibly had on the desk. So certainly a plus point there as the load capability seems to scale perfectly across the various buffer settings tested. 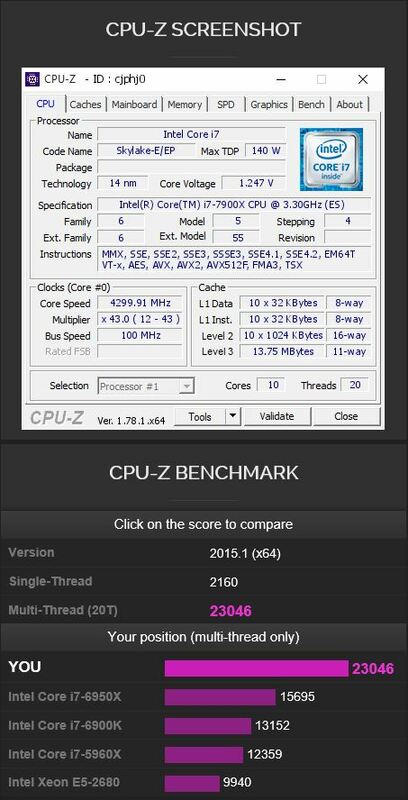 RAW performance wise I’ve run it through both CPU-Z and Geekbench again. 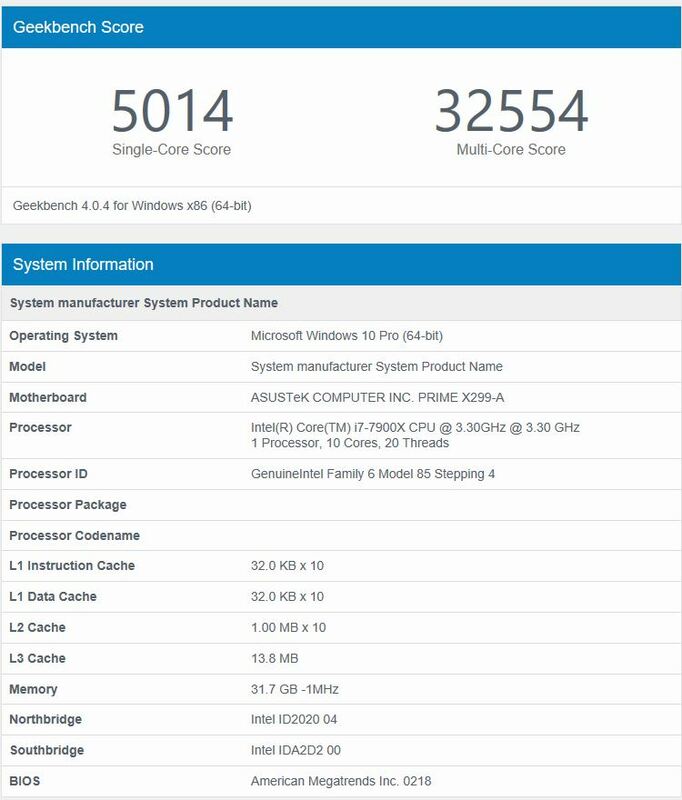 The multi-core result in Geekbench looks modest, although it’s worth noting the single core gains going on here compared to the previous generation 10 core the 6950X. On the basic DAWBench 4 test this doesn’t really show us up any great gains, rather it returns the sort of minor bump in performance that we’d kind of expect. However whilst more cores can help spread the load, a lot of firms have always driven home the importance of raw clock speeds as well and once we start to look at more complex chains this becomes a little clearer. A VSTi channel with effects or additional processing on it needs to be sent to the CPU as a whole chain as it proves rather inefficient to chop up a channel signal chain for parallel processing. A good single core score can mean slipping in just enough time to be able to squeeze in another full channel and effects chain and once you multiply that by the number of cores here, it’s easy to see how the combination of both a large number of cores and a high single core score can really translate into a higher total track count and is something we see manifest in the Kontakt based DAWBench VI test. In this instance the performance gains over the previous generation seems quite sizable and whilst there is no doubt gains have been had from a change in architecture and that high-efficiency CPU usage we’ve already seen it should be noted here that this is close to a 20% increase in clock speed in play here too. When we test we aim to do so around the all core turbo level. Modern Intel CPU’s have two turbo ratings, one is the “all core” level to which we can auto boost all the cores if the temperatures are safe and the other is the “Turbo 3.0” mode where it boosts a single core or it did in previous generations, but now we see it boosting the two strongest cores where the system permits. The 7900X has a 4.5GHz 2 core turbo ability of 4.5GHz but we’ve chosen to lock it off at the all core turbo point in the testing. Running at stock clock levels we saw it boost the two cores correctly a number of times, but even under stress testing the 2 core maximum couldn’t be hit constantly without overheating on the low noise cooling solution we are using. The best we managed was a constant 4.45GHz at a temperature we were happy with, so we dialed it back to all core turbo clock speed of 4.3GHz across all cores and locked it in place for the testing, with it behaving well around this level. It’s not uncommon for a first few batches of silicon on any new chip range to run a bit hot and normally this tends to get better as the generation gets refined. It’s the first time we’ve seen these sorts of temperatures on a chip range however and the is a strong argument to be made for going with either one of the top 2 or 3 air coolers on the market currently or defaulting to a water loop based cooling setup for any machine considering this chip. In a tower case this shouldn’t prove a problem but for rack systems, I suspect the 7900X might prove to be off-limits for the time being. I’d fully expect the i7’s that are going to come in below it to be more reasonable and we should know about that in the next update, but it does raise some questions regarding the chips higher up in the i9 range that are due with us over the next 12 months. The has already been some debate about Intel choosing to go with thermal paste between the chip and the heatsink, rather than the more effective soldering method, although early tests by users de-lidding their chips hasn’t returned much more than 10 degrees worth of improvement, which is a fairly small gain for such a drastic step. We can only hope they figure out an improved way of improving the chips thermal handling with the impending i9’s or simply return to the older soldered method, otherwise, it could be quite some time until we see the no doubt hotter 12+ core editions making it to market. In isolation, it looks fine from a performance point of view and gives the average sort of generation on generation gains that we would expect from an Intel range refresh, maybe pumped up a little as they’ve chosen to release them to market with raised base clocks. This leaves little room for overclocking, but it does give the buyer who simply wants the fastest model they can get out of the box and run it at stock. 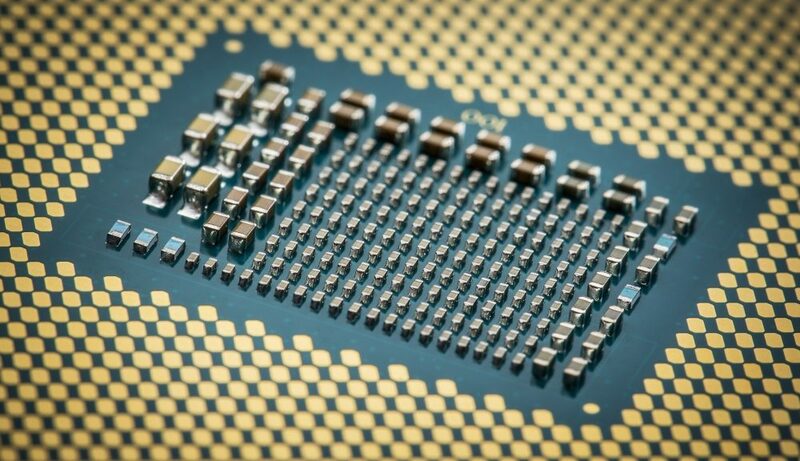 The problem is that this isn’t in isolation and whilst we’ve gotten used to Intel’s 10% year on year gains over recent generations, there has to be many a user who longs for the sort of gains we saw when the X58 generation arrived or even when AMD dropped the Athlon 64 range on us all those years ago. Ryzen made that sort of gain upon release, although they were so far behind that it didn’t do much more than breaking them even. This refresh puts Intel in a stronger place performance wise and it has to be noted that this chip has been incoming for a while. Certainly since long before Ryzen reignited the CPU war and it feels like they may have simply squeezed it a bit harder than normal to make it look more competitive. This isn’t a game changer response to AMD. I doubt we’ll be seeing that for a year or two at this point and it will give AMD continued opportunities to apply pressure. What it has done however is what a lot of us hoped for initially and that it is forcing Intel to re-examine its pricing structure to some degree. What we have here is a 10 core CPU for a third cheaper than the last generation 10 core CPU they released. Coming in around the £900 it rebalances the performance to price ratio to quite some degree and will no doubt once more help make the “i” series CPU’s attractive to more than a few users again, after a number of months of it being very much up for debate in various usage segments. So will the impending AMD Threadripper upset this again? I guess we’re going to find out soon enough over the coming months, but one thing for sure is that we’re finally seeing some competition here again, firstly on pure pricing but surely this should be a safe bet for kick-starting some CPU advancements again. This feels kinda like the Prescott VS Athlon 64 days and the upshot of that era was some huge gains in performance and solid improvements being made generation upon generation. The cost and overall performance here keeps the 7900X in the running despite its obvious issues, and that raw grunt on offer makes it a very valid choice where the performance is required. The only real fly in the ointment is the heat and noise requirements most audio systems have, although hopefully as the silicon yields improve and refine this will mature into a cooler solution than it is now. It’s certainly going to be interesting to see how this pans out as the bigger models start making it to market over the coming year or so and of course with the smaller i7 brethren over the coming days. 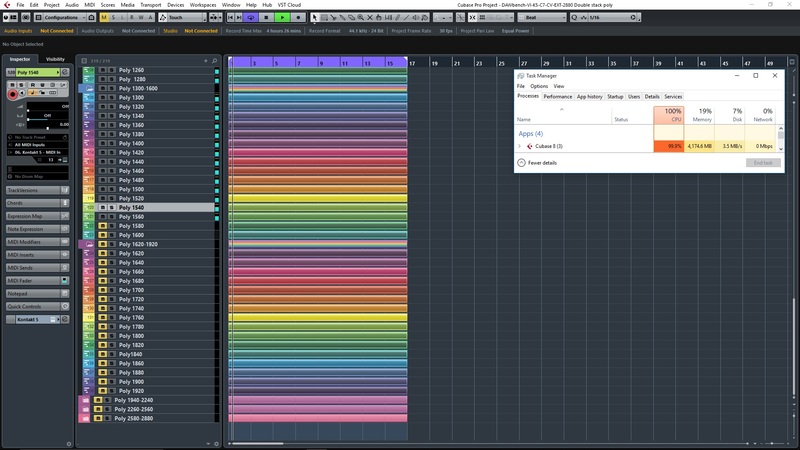 Previous PostFree music packages for your studio DAW.Next PostCasting an eye over the Intel i7 Skylake X editions.